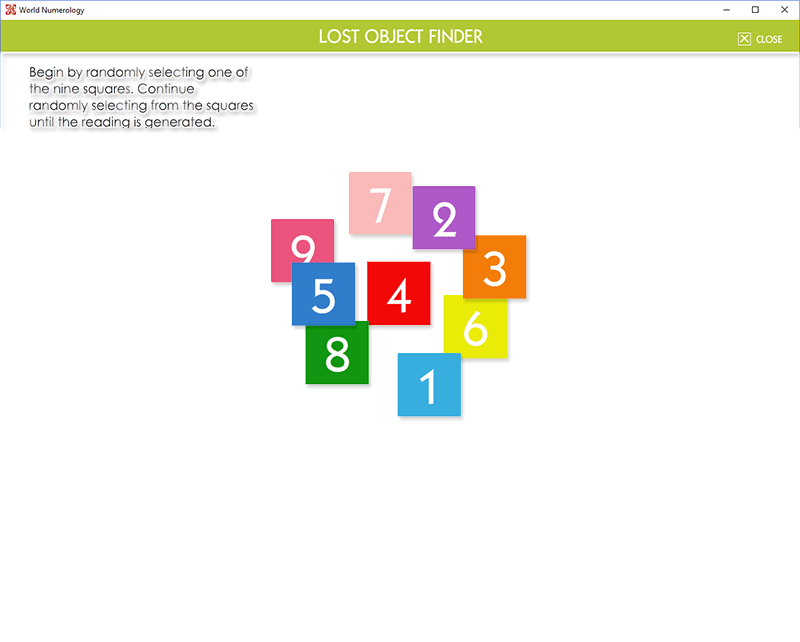 The Lost Object Finder taps into your subconscious to bring you back to the moment you last saw or touched the object. The method you used to choose this nine-digit number is influenced by your subconscious, and is neither random nor coincidental. 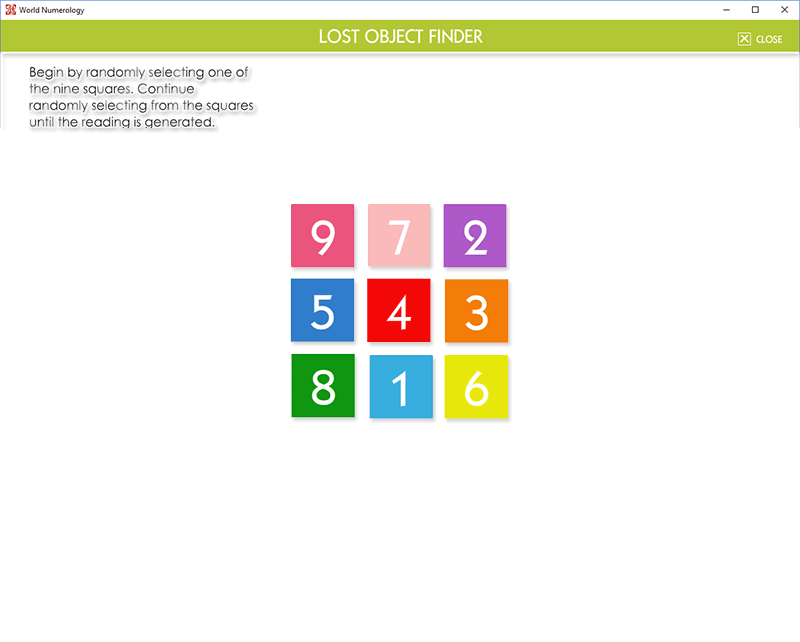 NOTE: This is just a sample showing how the Lost Object Finder works in the World Numerology App. What you see below is not a working module. 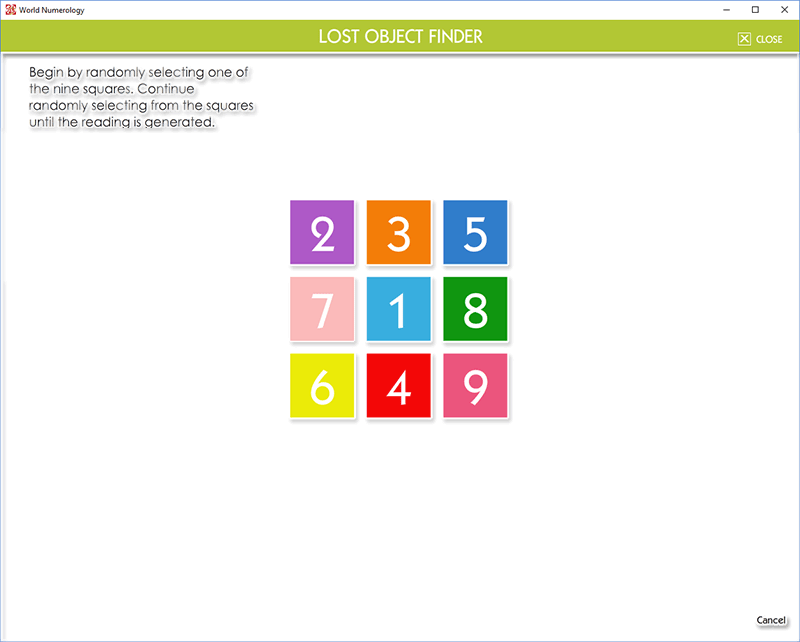 As with our Inner Reflection Reading, the color and placement of the numbers you chose changes after each selection. This diminishes any subconscious preference caused by a subliminal connection to colors and locations. Every action you take and every observation you make, whether consciously or unconsciously, is permanently stored in your subconscious. When a car passes by while you are talking to someone, the car may be no more than a blur in your peripheral vision, but it is recorded and stored nonetheless. It happened, your eyes caught it, and the information left an imprint in your brain. This is the case whether your memory is acute or not. Your ability to retrieve such information is another matter entirely. In theory, it is possible to remember the license-plate number of the car above at a much later date. In fact, this type of retrieval is commonly attained with the help of hypnosis. Numerology can help you take advantage of this vast storage of information by using a unique retrieval system. Let's say you recently lost a ring. Perhaps it fell out of your pocket, which caused a barely noticeable decrease in weight, or made a quiet "ploink" when it hit the carpet and rolled under the couch. Maybe you forgot where you last put it. It may be several days before you realize the ring is missing, however the moment you dropped or misplaced it is stored in your subconscious. Numerology can help you exercise your subconscious by asking you to select nine single digit numbers. While not infallible, this age-old method often has surprising results. It is near a place of rest, a bed or a lounge. It may also be between folded sheets or blankets.